Co-published by the Ilisu Dam Campaign Refugee Project,The Corner House and Peace in Kurdistan, A5, 132 pages, 2003. For more info on this subject see The Refugee Project - A UK coalition of environmental, human rights and development groups - has been working for the past two years to document such links and to provide a platform where refugees can voice their own histories. The vast majority of refugees today flee conflict, or social or economic oppression. In many cases, British companies, taxpayers and the government directly and indirectly support the human rights abuses that accompany British investment and policies abroad. Many of these abuses ultimately force people to flee their homes and then their countries. 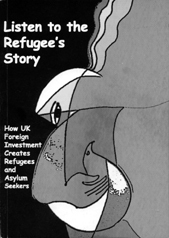 This publication includes stories, poems and drawings from refugees and asylum seekers, including Kurds, Colombians, Afghans, Nigerians, Burmese and Somalis, about why they have been forced to flee their countries. The book highlights broader links between enforced migration and global economic processes, poses key questions about trade and development policies and corporate accountability, and addresses the effects of the current "war on terrorism" on different communities. The book is now on The Corner House website in both PDF format, complete with illustrations, and as a straightforward html document for reading on screen. “Listen to the Refugee’s Story” is an excellent and genuinely important book, compiled and edited by Sarah Sexton of the Cornerhouse, Estella Schmid of the Peace in Kurdistan Campaign and Rochelle Harris of the Kurdish Human Rights Project. It is perhaps the first volume to interweave the deeply moving personal stories of a broad range of refugees with analyses of the governmental, corporate and institutional policies that play such instrumental roles in forcing people into flight from their homes and countries; it also looks at some of the campaigns that have sprung up to fight these policies and increase public awareness of them. With such a diverse array of elements in the book, it was no surprise that the launch was informative, wide-ranging, powerfully moving at times—and a lot of fun. After a brief welcome from Halkevi chair Ibrahim Dogus, Nick Hildyard of the Cornerhouse began the evening. Nick succinctly laid out the remorseless logic of policies of ‘economic and social development’. The British Government’s Export Credits Guarantee Department (ECGD) spends almost half its annual budget of £4 billion subsidising the arms trade; the weapons they help to sell, frequently to countries with horrendous human rights records, will be used in conflicts that destroy communities and livelihoods. The support of governments and the World Bank for the construction in developing countries of massive dam projects, whose price tag is often exceeded only by their uselessness in power generation, has displaced over 80 million people since the Second World War. Those people have to live somewhere. It is the policies enacted by our governments, rather than a parasitical instinct for a mythical ‘soft touch’, which brings migrant people to the UK. The next set of speakers, all themselves refugees, did us the honour of sharing their stories with us with honesty and courage. Their stories show the impact on normal people’s lives of the unholy alliance of Western business interests and coteries of local government officials taking advantage of the institutional framework laid down by Western governments and banks. Marta Hinestroza represented hundreds of farmers whose lands were poisoned by BP’s Ocensa oil pipeline in Colombia; displaced by state security forces when they protested, many of her clients lived in shanty towns in the worst kind of poverty. When Marta tried to get them the rights BP had promised, her aunt was murdered and she received death threats that forced her to flee the country. Dele Igbinedion is also personally familiar with the ironies of what analysts have called “the resource curse”. As he notes, “In Nigeria, it is bad news if your land is rich in oil or is agriculturally fertile.” Also a lawyer, he was fired and his house raided by armed men after he represented a group of villagers whose land was suddenly co-opted without compensation by the state on behalf of a Belgian multi-national. He was followed on stage by Ko Aung, who gave a courageous and dignified account of the horrors he was subjected to after taking part in the Burmese student protests of 1988. The emotional truth and honesty he showed in sharing his story with us was a far more eloquent testimony to human resilience than the pinch-faced demonisers of refugees can ever hope to achieve. The evening then shifted over to performance. The Mayakovsky’s Circus Theatre Company, featuring performers from the Halkevi itself as well as from Austria, Finland and the UK, attempted to render in dramatic form the chain of events that precipitate flight from political dangers. Less overtly political were the evening’s youngest participants, a ten year-old Tamil drummer and his seven year-old sister, whose unwavering seriousness as she shimmered in an iridescent peacock costume through a series of complex dance steps was hugely endearing. After a short break, the renowned Kurdish singer Nawroz, twinkling with good grace, thundered out a welcome back audible for miles around. He was succeeded on stage by the evening’s special guest, comedian and activist Mark Thomas, who delivered his customary combination of feistiness and perspicacity. Mark was keen to remind the audience, as always, that far from being the chimerical jetsetters they purport to be, the men who adopt and enact the policies that bring refugees to this country “are only down the road”. Afghan poet Karim Meesaq then presented a moving and delicate poem, the English translation of which was ably performed at very short notice by Romilly of the Mayakovsky’s Theatre group. He was followed by perhaps the evening’s most surprising performer, the Somali poet Mohamed Abdulahi Sangub. Mr. Sangub is a genial man who looks like a middle-aged accountant and performs with a lyrical swiftness and fluency that would leave Eminem slinking from the stage abashed. Even before the unfortunate translator tried his best to summarise, it was possible to understand what had been said without knowing a word of Somali. The final contributors to this marathon event were speakers from some of the many NGOs and campaigns that are striving to correct the wilful misinformation and ignorance that surrounds the refugee issue. Teresa Hayter, one of the contributors to Barbed Wire Britain, summarised succinctly and intelligently the case against migration controls. Hannah Griffiths from Friends of the Earth looked at some of the environmental disasters caused by infrastructure projects funded by Western governments, which have resulted in the flow of refugees back to the West. And George Binette of the Committee to Defend Asylum Seekers and Emma Sangster from Voices UK offered messages of solidarity and cogent observations. In all, a really interesting, powerful and enjoyable evening that brought refugee communities out of their imposed anonymous homogeneity and into individual life and voice. Get the book and see a multi-faceted world that Blunkett can’t and won’t.